The Duke and Duchess are coming to Santa Barbara! And CBS Los Angeles thinks the Painted Cave Kayaking Adventure is a trip “Fit for a Royal.” This amazing all day excursion departs from Santa Barbara Harbor, includes yummy breakfast and lunch, world class sea cave kayaking in Channel Islands National Park, options for snorkeling, hot showers when you get out of the water and amazing Pacific vistas throughout the day. 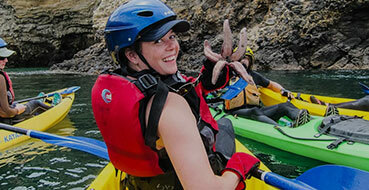 Learn more about this amazing Royal Summer Painted Cave Kayaking Excursion or Book Online Today!